(PSbMV) is an economically damaging viral pathogen of field peas and lentils that can cause significant losses in seed yield and quality, especially when infections occur before or during bloom. 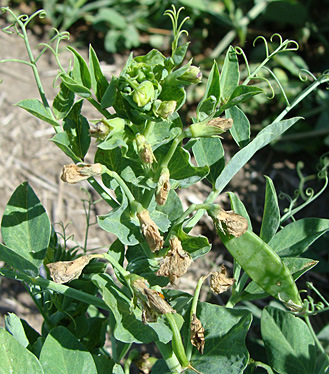 It has been observed on field peas and lentils in North Dakota and on field peas in Montana. PSbMV is distributed worldwide, and it presumably was introduced to North Dakota and Montana on seed imported from other regions. PSbMV is seed-transmitted and spread between plants by aphids. When aphid populations are high, planting even low levels of infected seed can result in severe epidemics. Infested seed and the movement of aphids from infested crops are important contributors to the local spread of PSbMV. In peas, PSbMV causes stunting, reduced internode lengths and malformation, and often results in the formation of malformed terminal rosettes (Fig. 1, 2). The virus can delay plant maturity, leading to uneven crop maturation (Fig. 3, 4). Infected leaves can exhibit clearing and swelling of veins, slight downward curling of leaf margins, chlorosis and/or a mottled or mosaic discoloration (Fig. 5). Pods often are deformed (Fig. 6), and seeds produced from infected plants can exhibit pronounced discoloration (Fig. 7), splitting of seed coats (Fig. 8), shriveling and reduced size. 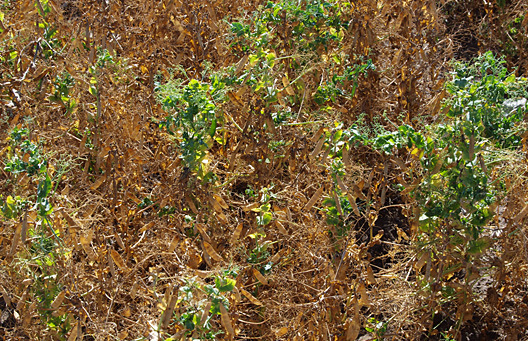 PSbMV causes similar symptoms in lentils, including stunting, shortening of internodes, reduced leaf size, downward curling of leaflets, chlorosis or necrosis of shoot tips, mild mosaic discoloration of leaves and deformed pods. 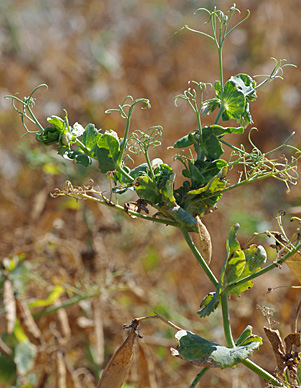 Seeds produced by infected plants often are reduced in size. 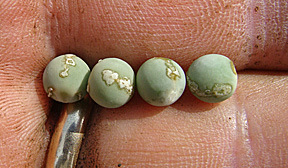 PSbMV-related seed discoloration is less common in lentils than peas. The severity of PSbMV symptoms varies widely. 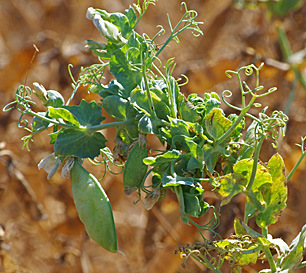 Infected peas and lentils do not always develop symptoms of PSbMV, and infected plants sometimes remain completely asymptomatic, even in susceptible cultivars. Some strains of the virus result in a mild, transient expression of symptoms readily apparent for only a few weeks prior to bloom, while other strains of the virus result in clear symptom expression throughout crop development. The number of generations of virus transmission exclusively through seed (without new transmission events through aphids) also can affect symptom expression and result in asymptomatic plants with virus detection only in flowers and seeds. Infected seeds are often asymptomatic, and while infection by PSbMV often results in an overall reduction in seed size and weight, PSbMV-infected seeds can be found in the entire range of seed sizes found in infected seed lots. PSbMV and other viruses can be difficult to identify accurately on the basis of visual symptoms. Two or more viral diseases often occur together, resulting in a mixture of symptoms. Abiotic stresses such as nutritional imbalances, herbicide toxicity and insufficient or excessive water can result in foliar symptoms similar to those caused by viruses. Seed quality losses caused by PSbMV can easily be confused with damage caused by fungal pathogens or damage incurred during harvest or storage. For accurate detection of PSbMV, laboratory analysis is required. Nucleic-acid based techniques (reverse-transcriptase PCR [RT-PCR]) and serological techniques (tissue blot immunoassay [TBIA] and enzyme-linked immunosorbent assay [ELISA]) have been shown to be sensitive and accurate. However, when levels of virus infection are low or when virus expression is transient or limited to parts of the plant that were not tested, false negative results still may be reported with these techniques. The evaluation of seed lots for PSbMV is best done with nucleic-acid based or serological techniques. Bioassays in which seeds are planted in the greenhouse and levels of seed-borne PSbMV are determined by assessing plants for visual symptoms of the virus can result in false-negative results. Plants infected with PSbMV sometimes do not develop symptoms or may develop only mild, transient symptoms that are difficult to identify. However, when maximum accuracy is needed, a combination of both approaches should be used, with all plants in a bioassay tested for PSbMV using laboratory-based techniques. PSbMV is seed-borne and seed-transmitted, and it is introduced into new regions through the movement of virus-infected seed. Seed transmission rates as high as 100 percent have been reported for PSbMV in field peas, with transmission rates as high as 30 percent commonly observed. Seed transmission rates as high as 44 percent have been reported for PSbMV in lentils, although the efficiency of seed transmission of PSbMV in lentils may differ by the strain of the virus. Secondary spread of PSbMV is facilitated by aphids. Aphids transmit the virus from diseased to healthy plants within fields, and they can spread the virus to neighboring fields. When aphid populations are high, even low levels of infected seed can result in severe PSbMV epidemics. More than 20 aphid species, including the pea aphid (Acyrothosiphon pisum; Fig. 9, 10), are known to transmit PSbMV. Aphids transmit the virus in a nonpersistent manner, obtaining and transmitting the virus in short feeding periods. The virus also can be introduced to fields from infected volunteers and other infected hosts. PSbMV infects and causes disease in chickpeas, faba beans and vetches (Vicia spp. ), and it is able to latently infect alfalfa, sugar beets, and several wild plants common to Montana and North Dakota, including black medic (Medicago lupulina) and shepherd’s purse (Capsella bursa-pastoris). PSbMV generally does not cause economic losses in chickpeas. 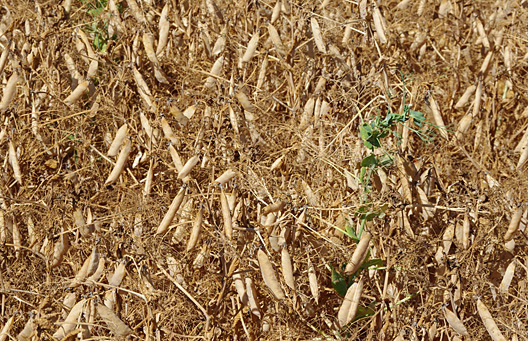 In peas and lentils, PSbMV can cause economically important losses in seed yield and quality. 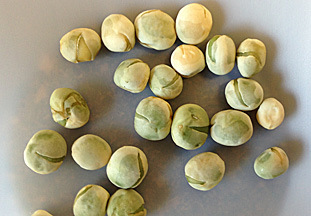 Seed quality losses associated with PSbMV are most pronounced in peas, where PSbMV causes seed discoloration, cracked seed coats, shriveling of seeds and reductions in seed size. Seed quality losses associated with PSbMV are less pronounced in lentils, where PSbMV-related seed discoloration is less common. Yield losses are proportional to levels of seed-borne infection and the timing of secondary virus transmission, with the most severe losses occurring when the secondary spread of the virus occurs before or during flowering. PSbMV-related yield losses are caused by a combination of reduced seed number and reduced seed weight. In field trials conducted in Australia on field peas, yield losses of 15 to 21 percent were observed when initial levels of seed-borne PSbMV infection were low (1 to 2 percent) and when aphids arrived at or shortly before bloom. At higher levels of seed-borne PSbMV infection (6.5 to 8 percent), yield losses of 13 percent or more were observed irrespective of when aphids arrived. The use of virus-free seed is the most effective strategy for managing PSbMV, and it is the best method for controlling PSbMV when resistant cultivars are not available. Only seed testing negative for PSbMV in laboratory tests should be used. PSbMV-infected plants do not always express symptoms of PSbMV or may express the symptoms only transiently, which means that diagnosing the disease accurately on the basis of visual symptoms can be difficult. Where PSbMV is detected, seed should not be saved. Infected seed is often symptomless, and infected seed cannot be fully eliminated from seed lots on the basis of appearance or size. Resistance to PSbMV has been identified in lentils and field peas, and resistance has been incorporated into some commercial cultivars of peas developed in other regions. Commercial lentil and pea cultivars adapted to North Dakota likely differ in their susceptibility to PSbMV, but the relative susceptibility of locally adapted commercial cultivars is unknown. Insecticides can help reduce the secondary spread of PSbMV by reducing populations of aphids that transmit the virus, but insecticides provide only partial control. Insecticides may provide unsatisfactory results, especially when PSbMV-infected seed is planted. Nonpersistently transmitted viruses such as PSbMV are carried transiently by aphids, and killing infected aphids with insecticides may result in only a modest reduction in transmission events. Systemic insecticides, which primarily are transported in the sap-conducting (phloem) cells of plants, often provide inconsistent control of nonpersistently transmitted viruses such as PSbMV, which are acquired from and transmitted to epidermal cells on the leaf surface, not phloem cells. Insecticides are most likely to be successful when applied to prevent economic aphid populations from being established, especially where seed-borne transmission of PSbMV has occurred in one field and suppression of secondary spread to neighboring fields is desired. The timing of insecticide applications is recommended on the basis of aphid populations. Scouting for pea aphids should be conducted at least weekly from late vegetative growth through pod development using a visual count or 15-inch sweep net samples. 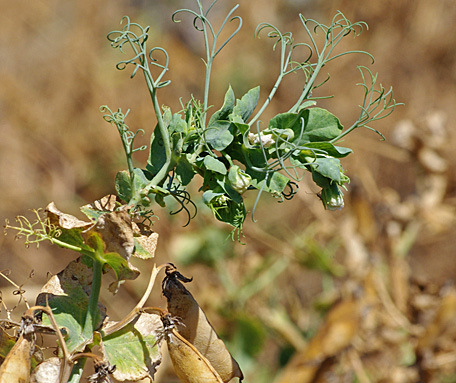 When peas are grown near alfalfa fields, scouting should be intensified after alfalfa cuttings; alfalfa can be a latent (asymptomatic) host of PSbMV, and cutting alfalfa often results in an influx of aphids into neighboring legume crops. The numbers of pea aphids in the upper 8 inches of plant tips should be counted on 10 plants from four different areas of the field (a total of 40 plants) or from 25 sweeps with an insect sweep net (each 180 degrees) conducted at four different areas of the field (a total of 100 sweeps). 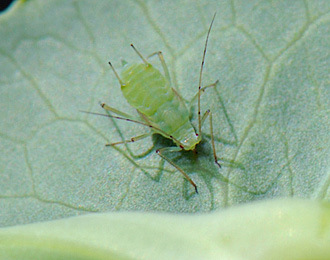 In field peas, an insecticide application would be justified if aphids reach the economic threshold level of more than an average of one to two aphids per plant or 10 aphids per sweep. In lentils, insecticide treatment for pea aphid control should be considered (1) when the economic threshold of an average of 30 to 40 aphids per sweep is observed, (2) when few natural enemies are present and (3) when aphid numbers do not decline during a two-day period. If the economic threshold is exceeded, a single application of insecticide usually will be sufficient.